Susan's Cooking School: No Pizza Stone? No Problem! I'm often asked whether it is necessary to use a pizza stone for making pizzas and breads, so I made a video (below) to address that question. The short answer is no, but let me explain further. The purpose of using a stone for baking pizzas and artisan style breads is that the preheated stone applies direct (and correct) heat to the bottom of your pizza or bread dough allowing it to rise again in the oven, before a crust is formed on your dough, preventing the dough from expanding anymore. You may think, well, my oven is hot, so why do I need the stone for heat? The reason is, that when you open the oven door on a household oven, a great amount of heat is lost immediately into the kitchen. In addition, if your bread is on a pan, it takes time for the heat to travel through the metal to get to the bottom of the loaf. During this time, a crust is forming on the dough, preventing it from rising further. The crust of lean (not much fat) yeast doughs, like french bread, firm up quickly in the oven and the resulting bread may be dense if the dough didn't get a chance to "spring" during the early baking process. (Steam also helps. See my How to Make French Bread video and recipe for more on that subject). Placing the dough directly on a preheated surface provides instant heat to the bread or pizza dough enabling it to rise before a crust is formed. With pizza, this is not as crucial, because the dough is usually covered with toppings that keep the dough moist allowing for oven spring to occur. However, the direct heat of the stone will give your pizza a little extra boost. (I also enjoy baking my pizzas in an olive oiled sheet pan, but that's described here.) See my pizza dough video and recipe. So what are some alternatives to baking with a pizza stone? Let me say one more thing about the pizza stone - it takes a long time to sufficiently preheat. I have two different kinds of pizza stones and they both take 30-45 minutes of preheating to get hot enough to bake on. You can't assume that the stone is the right temperature just because the oven temperature is. The stone takes longer to heat than the air in the oven, which is what the oven thermometer is reading. I usually bake my hearth style breads and pizzas between 400-425 F and will often turn my oven up higher (to preheat the stone a little quicker) and then bring it back down to the desired temperature. The reason I mention this here, is that the good thing about the stone alternatives shown in my video/slideshow below, is that they all preheat much quicker than the pizza stone. Basically, by the time the oven is the right temperature, so is the baking surface. However, one great advantage of using a pizza stone (I guess that's two more things), is that it doesn't need to be washed after use. With some of my alternative methods, that's not the case. I give several methods in the video that mimic baking on a stone that provide satisfactory results, as you can see in the finished products. This doesn't mean that you shouldn't get a stone - they're not very expensive, at least mine weren't. They do last a long time and provide better heat retention in the oven than my alternative methods. Even though I own two baking stones, I enjoy experimenting with other methods, especially if I need to bake/teach somewhere that would necessitate my having to drag along my own stone! Well, enjoy the video and I hope you will find some suggestions that will be helpful to you. This video has closed captioning. You're the best! Thanks for the tutorials! 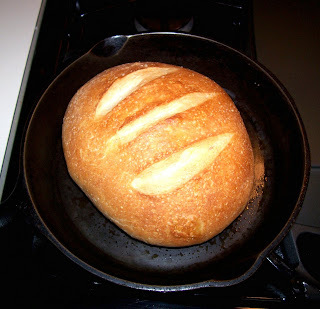 I was looking for some tips to cook bread products without the "fancy" kitchen items. Great information Susan, thank you very much! I've just started baking bread and this is an immensely helpful post--everything else I've found so far just assumes that I've already bought a pizza stone! I will be using these tricks until I feel a stone is worth the investment. Thanks!